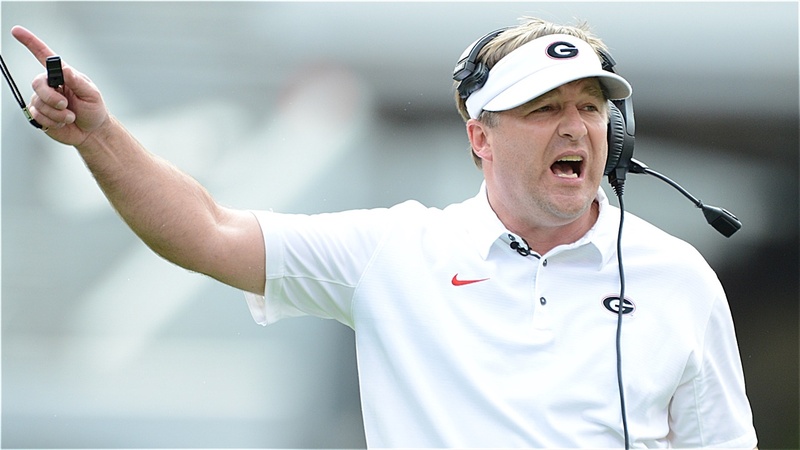 Kirby Smart has yet to make national recruiting “the” major focus for his program. Georgia still attacks metropolitan Atlanta and the South with vigor. But today’s trip out west for the former UGA defensive back shows that the program is either slightly shifting its focus, or is starting to grow nationally with its focus. Dell McGee was in California Tuesday. Kirby Smart will be in Las Vegas tonight. With the Pac 12 struggling to find it’s footing nationally (the conference has not to sent a team to the College Football Playoff in the last two years), Georgia is attacking. Matt DeBary is reporting that Kirby will be in Las Vegas tonight at the basketball game of 2020 5-star Desert Pines (NV) TE Darnell Washington. Kirby is following up on Todd Hartley’s visit to see Washington last Wednesday. That’s one to watch for sure as Washington is considered either the top tight end, or one of the top few prospects at that spot in the country for the next cycle. McGee dropped by Calabasas in California on Tuesday. That’s where 2020 5-star Calabasas (CA) WR Johnny Wilson and 4-star Calabasas (CA) WR Jermaine Burton play together. Burton has been enrolled at three different high schools - including Hapeville Charter. He was also committed to Miami for some time, before backing away from that commitment, so he knows Hartley. McGee offered Wilson on Tuesday. Kirby and new offensive coordinator James Coley offered three St. John Bosco (CA) players: 2020 WR Kris Hutson, 2020 LB/DB Kourt Williams and 2020 RB Nathaniel Jones. 5-star QB D.J. Uiagalelei goes there, but looks like he’s headed to Clemson - Georgia will give it a shot though. Meanwhile, UGA offered offered 2022 WR Luther Burden out of Cardinal Ritter College Prep (MO). While the swing out west was the spotlight of the day in recruiting, the rest of UGA’s staff moved around their usual stomping grounds, too. Tray Scott stopped by Hammond School (SC) today to check on 2020 DL targets Alex Huntley and Jordan Burch. Huntley is a big target for UGA, but both players are Top 200 prospects in next year’s cycle. Hammond is in Columbia, so UGA will have to fight off Carolina and likely Clemson for that duo. Georgia also offered 2020 4-star DL Myles Murphy of Southwest Guilford (NC), and 3-star 2019 McEachern RB Paris Brown was offered a preferred walk-on spot. The Bulldogs also offered 2020 Gonzaga (MD) OT Olu Fashanu and 2021 Gonzaga (MD) QB Caleb Williams yesterday. Georgia offered 2020 OL Myles Murao of Mater Dei (CA) on Tuesday.